Immerse yourself in the Iron Maiden universe! Collect 11 different 4-inch tall mini-figures! Assortment includes Eddie is various forms and other characters. Look for Clairvoyant, Cyborg, Goddess Aset, Holy Smokes, Owl Cultist, Pharaoh, and more! 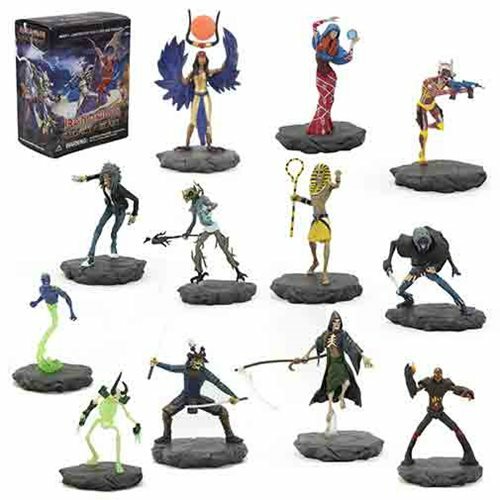 Wave 1 display tray contains 12 individually packaged, randomly selected, blind boxed figures. Immerse yourself in the Iron Maiden universe with these magnificent mini-figures from the mobile game Iron Maiden: Legacy of the Beast! Collect 11 different characters that include Eddie in different forms like Assassin and Gunner. Each collectable figure measures about 4-inches tall and comes packaged in a blind bag. Which characters will you get? Ages 15 and up.